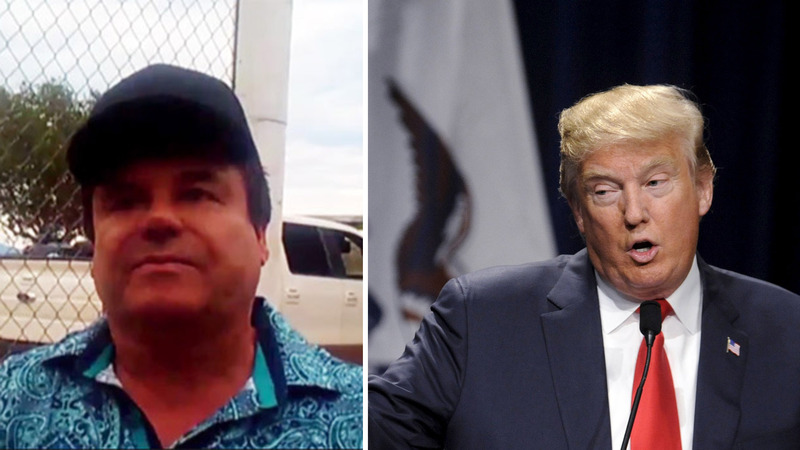 El Chapo on Donald Trump: "Mi amigo!" Like many things that will happen in 2016, actor Sean Penn's interview with Mexican drug lord Joaquin "El Chapo" Guzman was inevitably tinged by the U.S. presidential election. In his story about the meeting - which apparently helped Mexican authorities recapture Guzman after he escaped from a maximum security prison in July - Penn wrote "I am reminded of press accounts alleging a hundred-million-dollar bounty the man across from me is said to have put on Donald Trump's life. I mention Trump. El Chapo smiles, ironically saying, 'Ah! Mi amigo!'" An unverified Twitter account purporting to belong to El Chapo sent Trump a threatening and profanity-laced message in response to some of Trump's tweets about the drug lord. The message has since been taken down, but it prompted Trump to alert the FBI. Trump talked about El Chapo to bolster his claim that Mexico sends drugs (along with criminals and rapists) into the U.S.
That hasn't deterred Trump from talking about the drug lord's recapture at his rallies. "Mexico is going to be the new China because what they're doing to us is unbelievable, although they did catch El Chapo. Good? Good? They did catch El Chapo, that's good. I mean I don't know, he better not escape a third time, you know? Those tunnels, bing, boom, right under the toilet, bing boom, right up. It's pretty amazing when you think about it, right? But anyway. I have an idea: Put him on the fourth floor this time, right? No more, no more first floors," Trump said Saturday in Clear Lake, Iowa. He was referring to Guzman's July escape through a 1-mile tunnel from a small opening in the shower area of his cell.